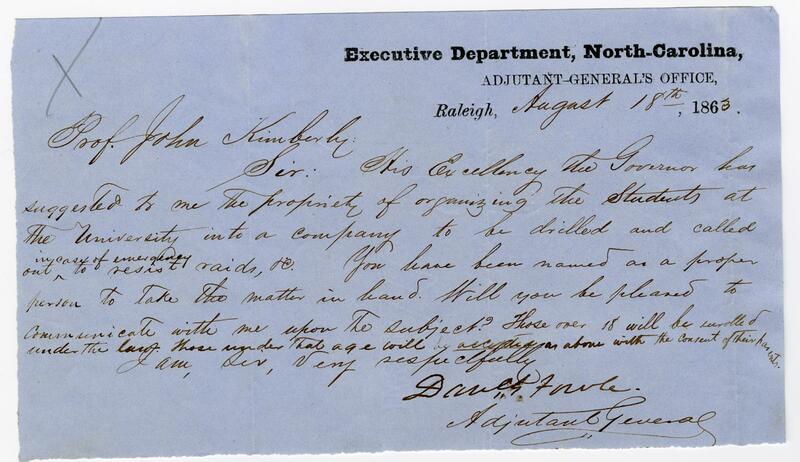 Item description: Letter, 18 August 1863, from Adjutant General Daniel Fowle to Professor of Chemistry John Kimberly stating that Governor Zebulon Vance had suggested mobilizing a contingent of University of North Carolina students for defense of the home-front. Item citation: From folder 42 in the John Kimberly Papers #398, Southern Historical Collection, The Wilson Library, University of North Carolina at Chapel Hill. Sir: His excellency the Governor has suggested to me the propriety of organizing the students at the University into a company to be drilled and called on in case of emergency to resist raids, etc. You have been named as a proper person to take the matter in hand. Will you be pleased to communicate with me upon the subject? Those over 18 will be enrolled under the law. Those under that age will be accepted as above with the consent of their parents. This entry was posted in Southern Historical Collection and tagged Daniel Fowle, Governor Zebulon Vance, homefront, John Kimberly, mobilization. Bookmark the permalink. Will be accepted as above with the consent of their parents.